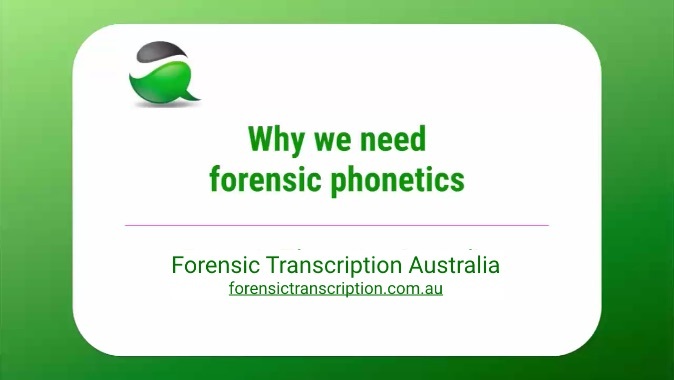 Forensic Transcription Australia exists to raise public awareness of a legal anomaly that compromises the fairness of trials in our criminal courts on a weekly basis. If you are impatient, dive straight into the video (90sec; WARNING: Most people find it mind-boggling). Otherwise read on for an explanation, and catch the video at the relevant place in the discussion. Covert recordings are conversations captured without the knowledge of the speakers, usually by telephone intercept or some form of ‘bugging’. Covert recordings are lawfully obtained for many major crimes. They can provide very helpful evidence, letting the court hear people making admissions or giving information they would not be willing to provide openly. Sounds exciting – where’s the problem? For covert recordings to provide valid evidence, it is essential to establish accurately who is speaking and what they are saying. It is easy to see how an error about either one could be seriously misleading to the jury. Determining what is said and who is saying it may seem like a straightforward matter of listening to the recording. With covert recordings, however, there can be a lot more to it. Since covert recordings have to be made secretly, it is difficult to control their recording conditions. As a result, they are often of very poor quality, to the extent it is genuinely difficult to hear what is said. Here’s an example of a covert recording that played an important role in a real trial for a serious crime. I think you can see how there could be potential for inaccurate identification of what is said and who is saying it in a recording like this. Even in a relatively clear recording, since you can’t see the speakers, it is far harder than you might think to determine who is speaking – to a level of certainty appropriate to the high stakes of a criminal trial. Isn’t there a science that can help with that? Yes, indeed. The science of forensic phonetics can potentially provide useful and reliable assistance in determining who is speaking and what they are saying. The problem is the law regarding covert recordings was developed without consulting phonetic science. Citizens are often surprised to discover that evidence about who is speaking and what they are saying in recordings like these is routinely accepted not from independent professionals, but from detectives on the prosecution team. Less often but still frequently, an audio engineer is consulted. Audio engineering is an entirely different discipline to phonetics. Audio engineers know about sound, but typically do not undertake any of the specialised study of phonetic science so crucial to reliable analysis of speech. This means it is alarmingly common for speech evidence to be presented to the jury with unreliable transcripts and/or inaccurate speaker identification. OK sounds bad – but the jury gets to listen to the audio and form their own opinion, don’t they? Yes they do. The law puts a lot of emphasis on the fact the judge has to instruct the jury to listen carefully to the covert recording, and form their own opinion as to its content. Unfortunately phonetic science has shown this is an unrealistic instruction. Here’s the 90 second video that dramatically demonstrates the reason. Well yes, on one level it is amazing how much a transcript can influence your perception. On another level though, it is very well known in phonetic science. From that point of view, what’s amazing is that the law went ahead and developed its whole process for evaluating police transcripts on the basis that the defence, and ultimately the jury, could simply ‘check’ the transcript against the audio. Remember that in the vast majority of cases there is no alternative interpretation, and no opportunity for lawyers, the judge or the jury to listen to the audio ‘cold’ (i.e. without expectations regarding the content) before seeing the transcript. In the 90-sec video you had both of these advantages – and still your hearing was influenced by an inaccurate transcript.